There are only a few Italian/Mediterranean restaurants that I would happily return to, and Mediteca is one of them. The last time I was there, I only got to sample a small fraction of their menu, so I was elated to receive an invitation to enjoy their new menu items. It’s always heartening to see a restaurant putting effort into changing their menu every so often. 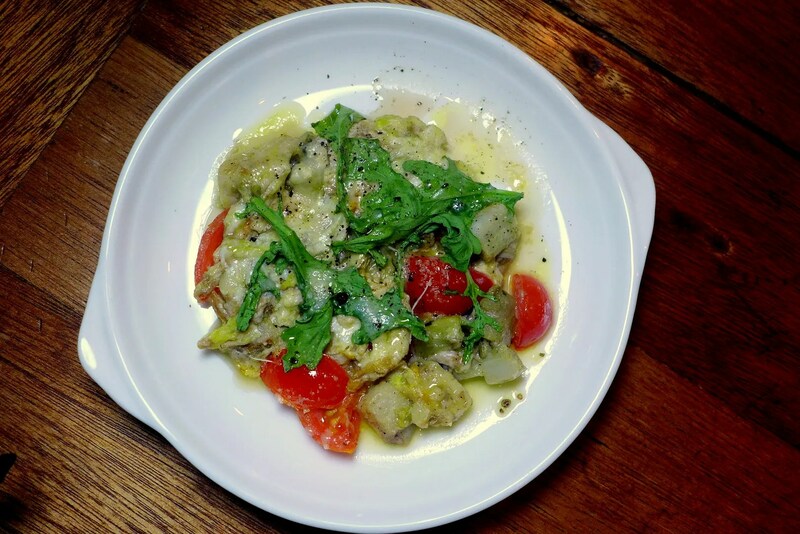 We had Chef Riccardo Ferrarotti that night who whipped up a sizable menu and I must say it was one of the most memorable meals I’ve had lately. We settled in with a glass (or 2) of Prosecco, which is always welcome after a long day. Once we got comfortable and deeper in our conversation, the tapas arrived, along with my favourite poison. Let’s talk about the food then. First up we have the very pretty Pan Con Tomate Y Serano. 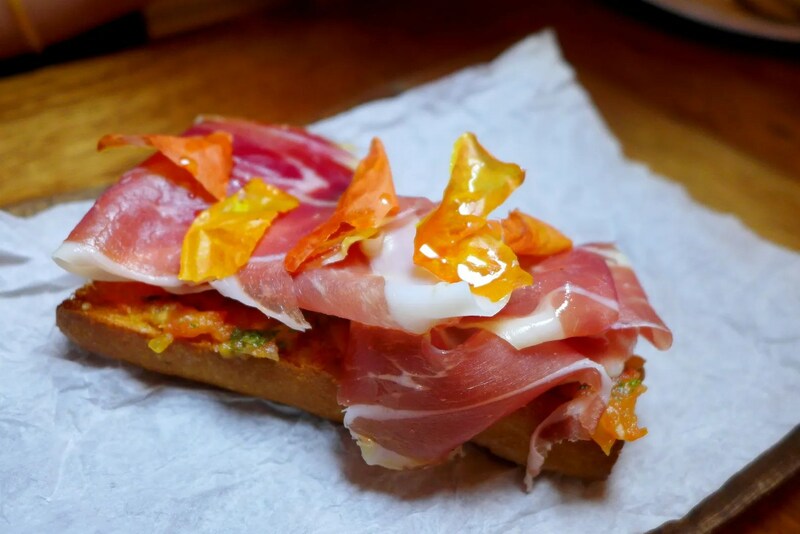 Basically toasted bread topped with Serrano ham and tomato. The orange sheets you see are dehydrated tomato skin. What a great way to start our meal as I loved how delicate the ham, against the juicy chopped tomatoes. Notes of basil came through too. If I wasn’t on Paleo diet, I would be happily chomping down that piece of beautiful bread. Yum! Who am I kidding anyway, I had pasta that night! Croquette with Spinach, Potato and Garlic. 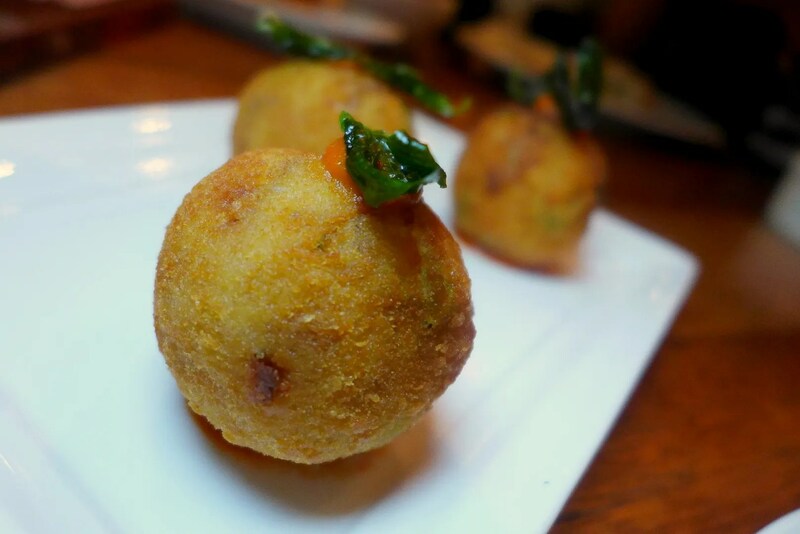 I can’t resist a good croquette and here they are filled with fluffy potatoes and bits of spinach. It tasted cheesy and I loved the sundried tomato paste. More balls and these ones are deep fried risotto, basically. 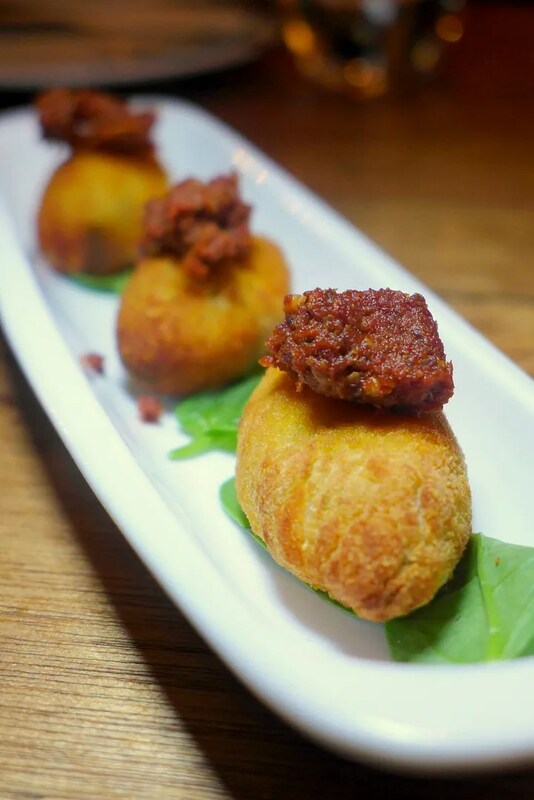 Mediteca stuffed their arancinis with Mozzerrella cheese, a sinful treat. I love the crispiness against the fluffy and creamy grains. The risotto also has a bit of Ham mixed in, delicious! This dish was pretty difficult to photograph, but no less tasty. I have a soft spot for rocket and I was surprised to find the artichoke that tender. A healthy yet comforting dish for sure. Oh what a sight to behold! 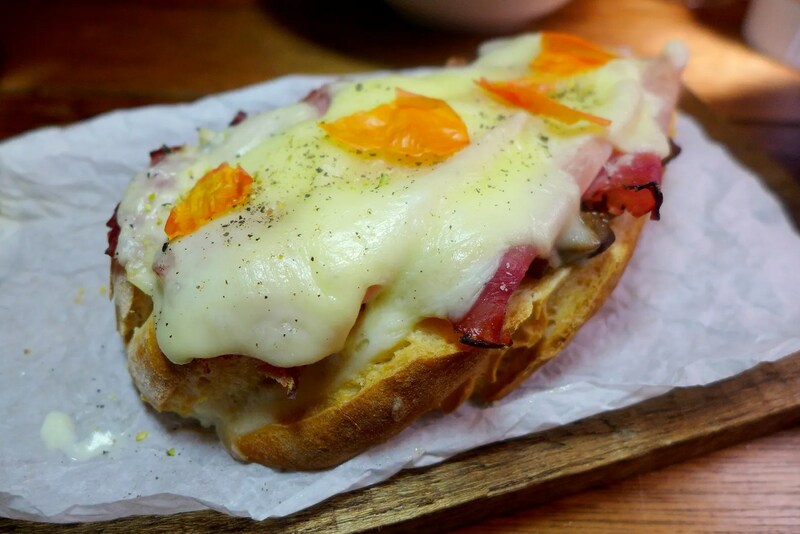 The same lovely bread is topped with Porchetta, Mushrooms and generous amount of Cheese. Mmmm. Full approval. One bite and all my restraint went out the window. 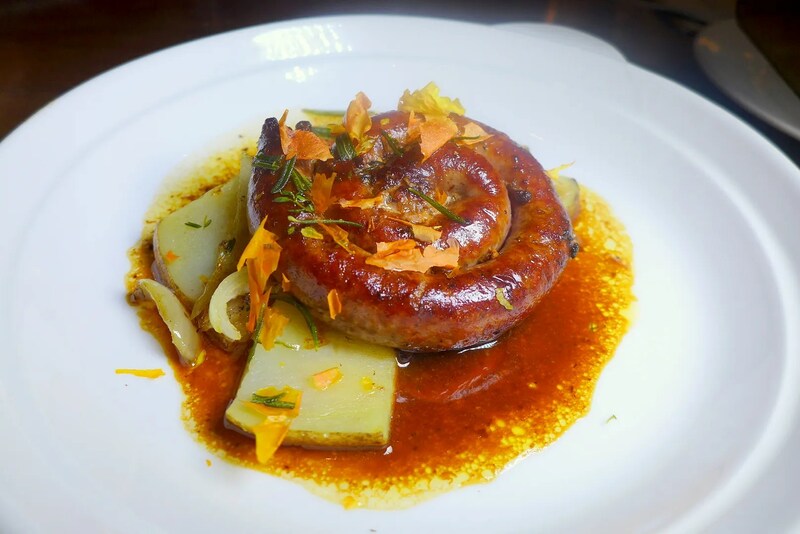 The umami, tender Porchetta, earthy mushrooms and the soft oozy cheese are perfect combination. Wow. 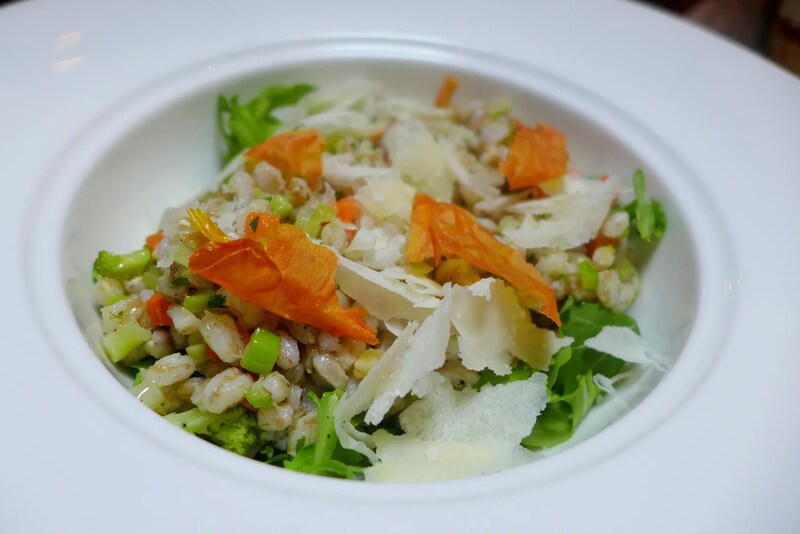 We moved on to the salads and the first one was something that’s still uncommon here: Farro. I’ve only had Farro in Oz prior to this, also called Spelt, it’s a type of wheat grain, not unlike a large version of Pearl couscous. This salad came with tomato, parsley, capsicum and zucchini, almost Middle-Eastern inspired I would say. While it’s relatively light, the shavings of cheese added a bit of richness to it. 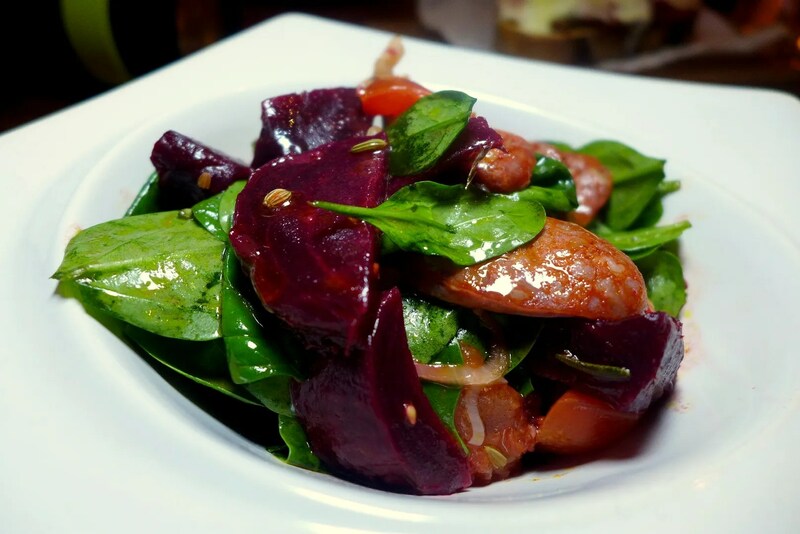 Beetroot Salad with Baby Spinach, Tomato, Leek and Sausage. But this one ticked all sort of boxes for me. I love beetroot, and even more so when it’s baked. I love the smoky and slightly spicy Chorizo, and a bit of Baby Spinach also agrees with me. I wouldn’t mind more of these now! Next we are stepping into danger zone: The Carbs! I know, I know. Naughty girl me. But at least I was consuming D-E-L-I-C-I-O-U-S carbs. That alone should be worth the calories. 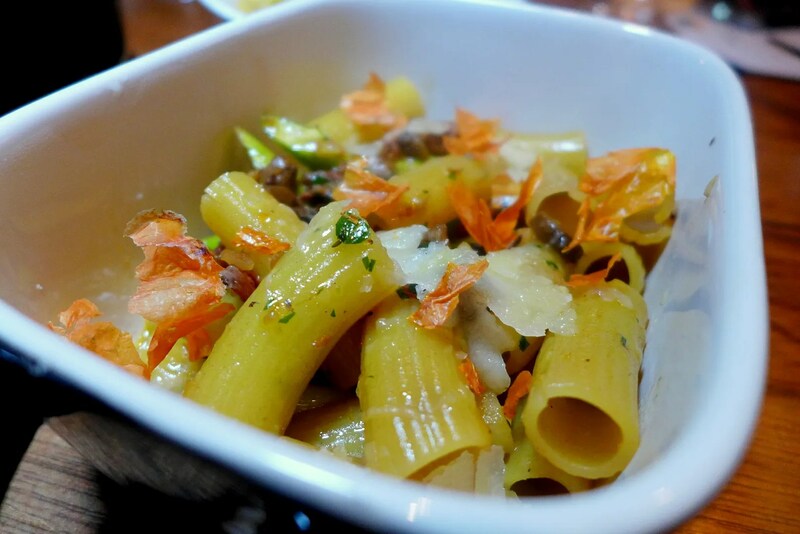 When it comes to Pasta, Mediteca sure knows what they are doing, with many creative choices on offer. 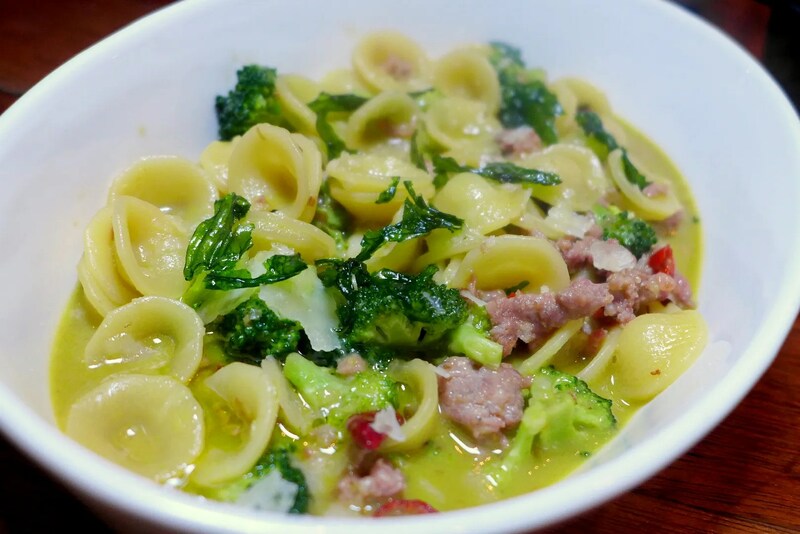 Orecchiette with Broccoli, Sausage and Chili. How can I not dive into this gorgeous thing? Orechiette means “Ear” and these are perfect to scoop up the tasty gravy. The crunch of the broccoli and sage (I think), tender sausage, the ever-so-mild kick of the chili and the aroma of white wine just make this dish so addictive. Rigatoni with Speck, Mushroom & Asparagus. Can’t pick a favourite between this and the last one, as I also love the combination of speck, mushrooms and asparagus. Well mainly the asparagus. Although I would say that Rigatoni is probably more suited to a saucier pasta. Nevertheless it’s tasty and I had more than one bite, that should say something. 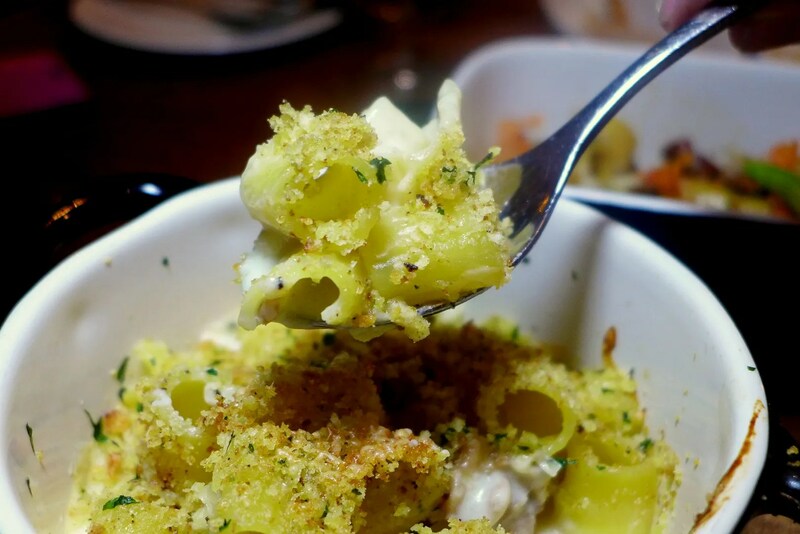 The most sinful of the lot has to be the Maccheroni. It’s creamy, cheesy with unmistakable aroma of Gorgonzola. If rich is your thing, you would definitely love this. Love the crunchy top consisting of breadcrumbs and walnuts. And we were not done yet! There were still some more main dishes. And. Errr. Desserts. 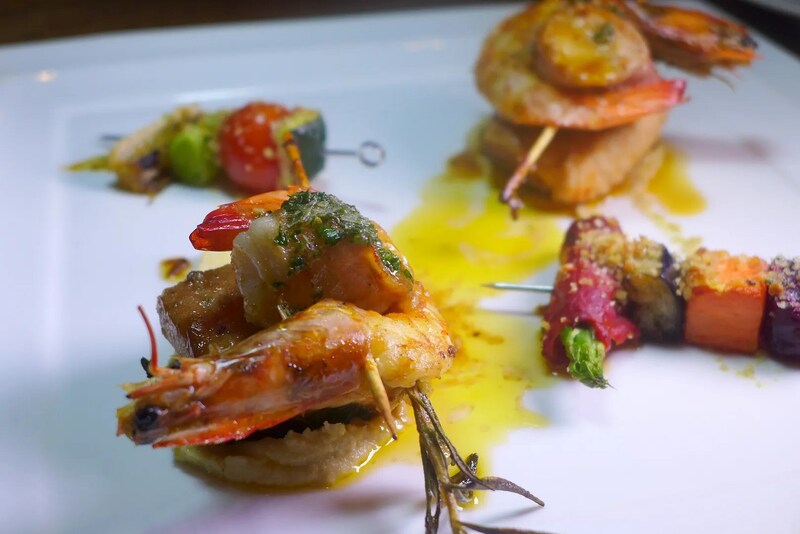 Nice to see a seafood course and here everything was skewered and grilled. Very simple flavour, yet showcases the natural sweetness of the seafood. The vegetable kebabs were delightful too. I’ve never had Luganetta sausage before. This has a nice firm bite with smoky flavour, though it’s a little on the salty side. But nothing a little bit of potato can’t fix. I could barely fit anything in at this point. But of course I had to try the steak owing to its lovely pink centre. Interesting choice to top it with some Goats cheese too. 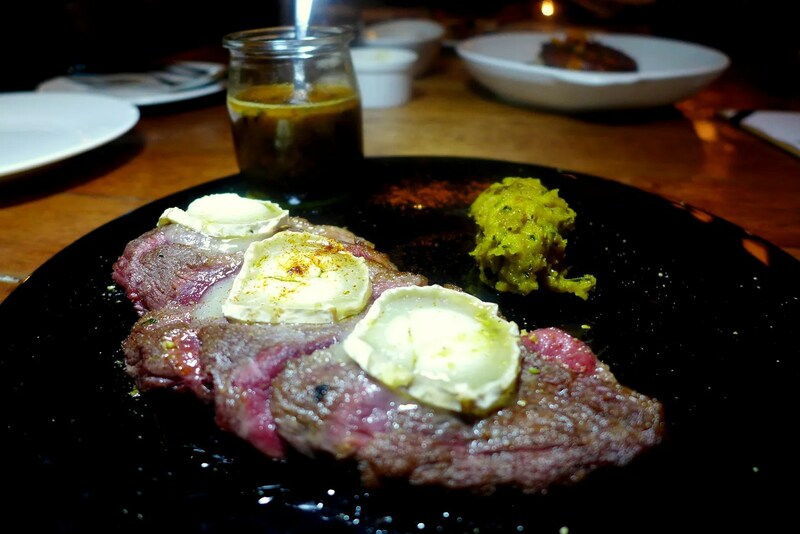 The beef was exquisitely tender. 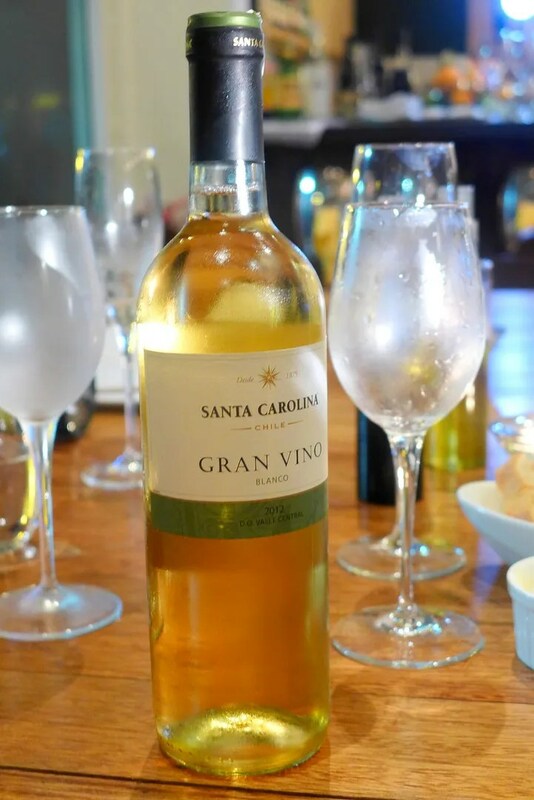 These Palate cleansers were very much welcomed after our heavy meal. 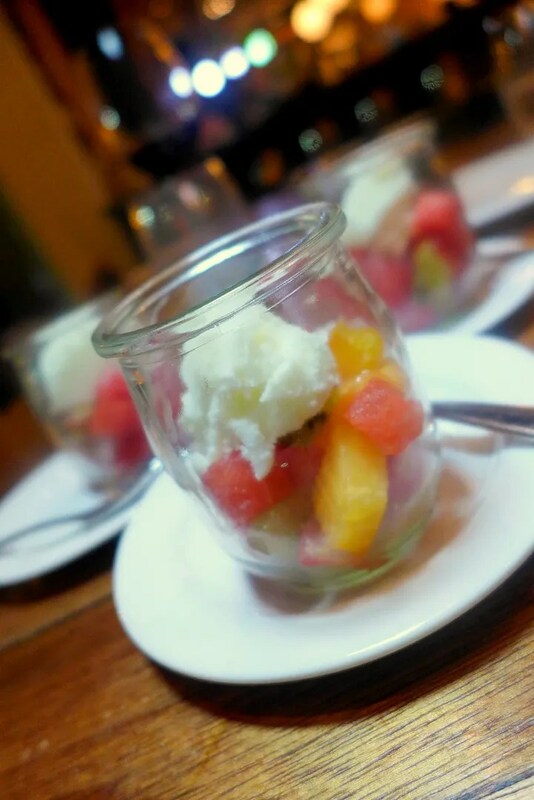 I enjoyed the refreshing sorbet along with fruits. So…. Moving right along to the desserts. If you see Tiramisu on offer, make sure you make a bee line for it. I didn’t get a good photo but it has to be the Best I’ve had in KL, without doubt. 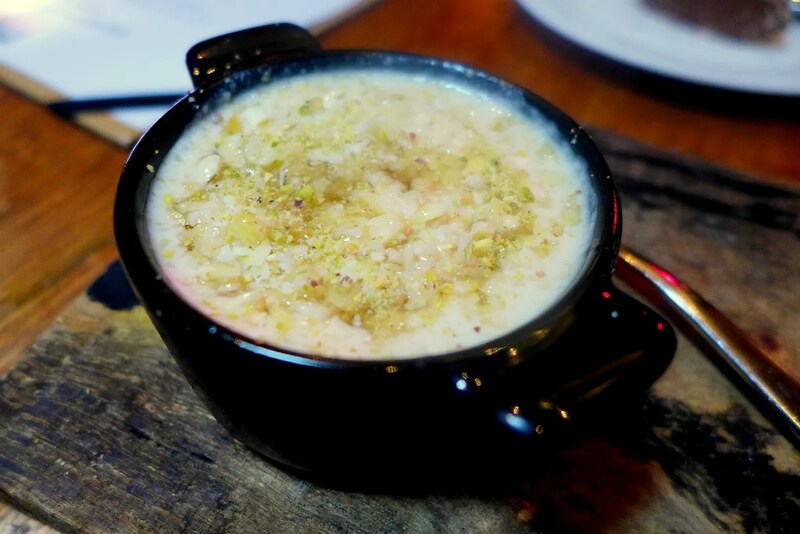 Rice pudding reminds me of Australia once again, it’s one of those super comforting desserts. I have to say this is probably too rich a dessert for me, though the Amaretto does keep it interesting and I love the aroma of the “real” Vanilla. 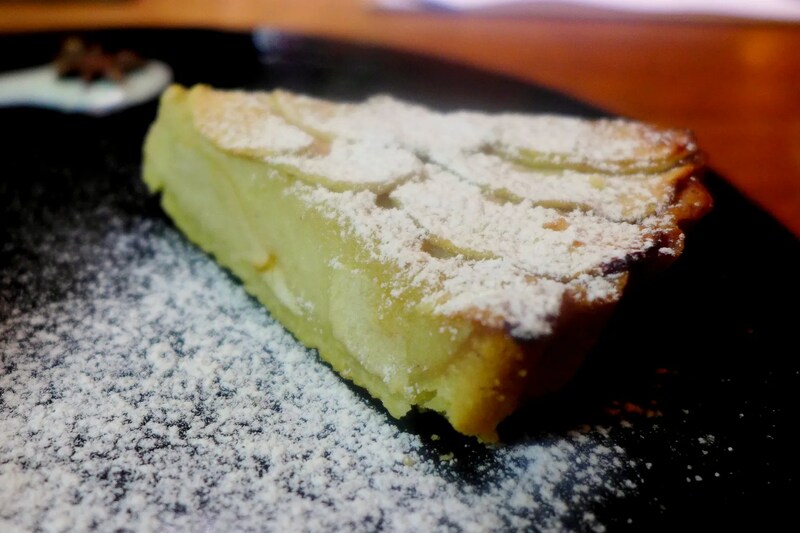 The Apple Tart is more to my taste. The Pastry is buttery and crumbly and the apple filling is just a tad sweet for me. But along with the Vanilla custard it is just right. At this point, I was waving my white flag frantically in the air. But what a great meal we had! No regrets, of course. Thank you Elaine for the scrumptious treat! Mediteca is now offering more specials on weekends. Apart from their Saturday Brunch which does a different European country each week, Mediteca is now open Sunday evening where diners can enjoy happy hours from 5pm to 8pm. Have your Happy Hour at Mediteca with ‘Aperitivo alla Milanese’ from 5pm to 8pm where you order Mediteca’s Italian cocktails and get to enjoy a spread of delicious tapas and snacks from their counter with no additional charges. My pick has got to be that thick and long sausage. Bet it tastes as good as it looks. Yes! It’s a bit salty so nice to pair with the potato.